There are a lot of animals that blend in visually with their environment; there are relatively few that can mask their smell. One exception is the puff adder. Recent research shows that this venomous snake is virtually scentless, the better to hunt for prey and elude predators. Bitis arietans, otherwise known as the puff adder, is native to Africa and Saudi Arabia. It hunts by ambushing its prey, and occasionally sneaks up on an unwitting human, too. Part of the reason it’s so successful is that the animal has no detectable scent, according to a team of scientists from the University of the Witwatersrand in Johannesburg, South Africa. It employs a form of olfactory camouflage known as “chemical crypsis.” The team described the results of recent field work in the Proceedings of the Royal Society B. The South African researchers trained both dogs and meerkats to recognize the scent of different snakes. Both animals were able to distinguish between cloths that were scented like snakes, and those that weren’t. This diagram shows the dogs’ accuracy in picking out cloths scented by the aurora house snake (Lamprophis aurora); brown house snake (Boaedon capensis); rhombic night adder (Causus rhombeatus); corn snake (Pantherophis guttatus); and the common file snake (Gonionotophis capensis). The bars marked “captive” and “wild” show the dog’s accuracy when it comes to picking out captive versus wild puff adder scented cloths. The meerkats were only tested on brown snakes and puff adders, since only those two snakes live on their territory in the wild. Both animals were equally unable to pick out the scent of a puff adder. The puff adder is a relatively thick meter-long snake that makes its living as an ambush predator. It stays still and waits for prey to wander to it. But the adder’s scentless nature might not only serve its hunting game. While it’s very poisonous, it’s not very fast. The researchers noted that in previous studies that tracked puff adders, the more the snake moved, the more likely it was to be captured by predators. Scentlessness might be for the snake’s protection. A scentless snake lying in wait is a scary prospect, especially since 50-percent of serious untreated bites result in death. Serious bite victims can look forward to pain, spontaneous bleeding, renal failure, and something called “compartment syndrome,” during which various organs swell up so much that they cut off their own blood flow. And puff adders can bite multiple times during each attack. 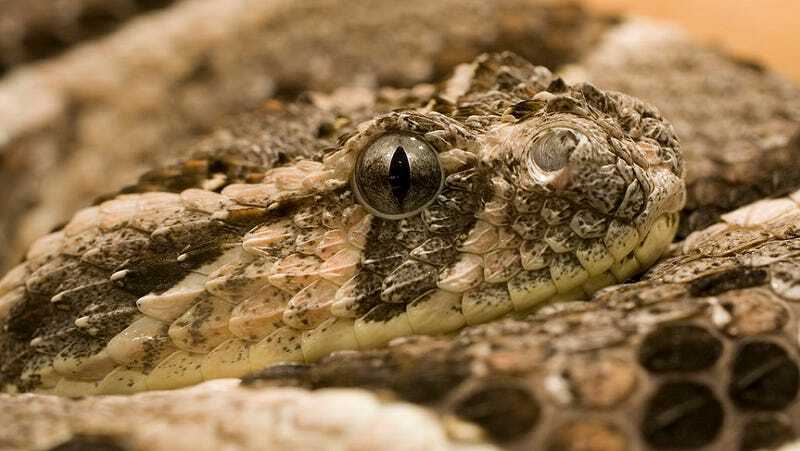 Any authors out there who are looking to kill one of their characters with the perfect scentless and invisible mode of death (that eludes even sharp-nosed guard dogs) now have the perfect weapon at their disposal: a puff adder.